Rooftop Reindeer welcomes more than 100 Santa & Mrs. Claus to the farm on October 21. They will be brushing up on their reindeer handling skills and making sure the reindeer receive their annual flight physicals. This is one of the most exciting days on the season at the farm. Stop in and see if you can tell which is the “Real” Santa and which are his helpers! Rooftop Landing Reindeer Farm has been named one of the 10 Best Places to See Reindeer by USA Today! Visit Santa and his reindeer!! Gift Shop with lots of stocking stuffers including FROZEN items. Heated reindeer barn with reindeer and our Christmas Alpacas for petting and photos. Santa will again be available to visit with children during our Christmas 2018 season! Also here will be the very popular Skittles the Clown doing face painting! You may take your own photos with Santa at no charge. 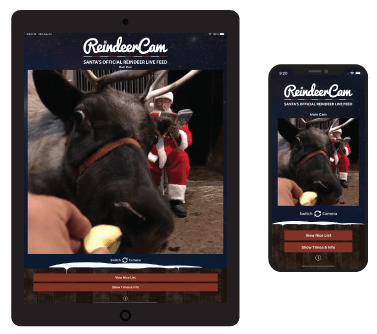 You may also choose to have your photos taken in Santa’s sleigh with Reindeer! The photos are great for Christmas Cards! The cost for photos in the sleigh is $15 for a 5×7 in a frame and includes a FREE download! Farm admission is just $5/per person ages 1 and older! CHILDREN LOVE TO RECEIVE MAIL! A beautiful 8”x10” signed photograph of Santa Claus – perfect for framing. A rare 8”x10” close-up photo of Rudolph “with your nose so bright” – a unique photograph! An informative collection of reindeer facts so your child can learn more about these special animals. A personalized “Nice List” certificate, signed by Santa and Rudolph, placing your child on Santa’s official list for 2018. One of Mrs. Claus’ favorite holiday recipes, simple and fun for the family to prepare together. A handcrafted ornament which includes authentic reindeer antler, naturally shed from Santa’s herd each year – a distinctive addition to the family Christmas tree! Find the date your photo was taken and click on the photo with its corresponding date. Find your photo within the gallery. Click “Download” on the bottom of your photo. Click here to see the complete NICE LIST! We have proof SANTA exists! Discover what over 5 million people already have–that Santa is real! Watch the Rooftop Reindeer live and see with your own eyes as Santa himself visits with them! Only $2.99 for a whole season of fun! Rooftop Landing Reindeer Farm is a family owned and operated business, specializing in offering trained reindeer for holiday and specialty events around Michigan. We have been in operation since 1991, visiting numerous schools, businesses, and even private homes. Our reindeer have been featured in dozens of newspapers, magazines, and trade journals throughout the midwest over the past several years. If you are looking for a unique way to celebrate the holidays or promote your business, consider giving us a call! Our Reindeer are scheduled to make MANY appearances throughout Michigan during November and December this year. Send us an email or phone us and we’ll be glad to let you know where and when we’ll be visiting your area. Thank you for visiting us during Calf Days to meet the newest arrivals on the farm. Please continue to watch our live webcams throughout the year. Meet the newest arrivals to the farm and check on your favorite reindeer. Stop by and see why Rooftop Landing Reindeer Farm has been named one of the 10 Best Places to See Reindeer by USA Today!